David Drake: Cell Phones More Dangerous Than Smoking! Cell Phones More Dangerous Than Smoking! OMG! What will the Militant Non-Smoking Nazi Little Eichmanns do now? They have a new reason to wet their pants in terror! How long before we see a campaign of, "No Second-Hand Radiation!" A recent study gave evidence that cellular phone use over a period of time poses health risks far greater than those obtained from smoking, or from exposure to asbestos. The study, conducted by Dr. Vini Khurana, suggested that "there is a significant and increasing body of evidence for a link between mobile phone usage and certain brain tumors." "It is anticipated that this danger has far broader public health ramifications than asbestos and smoking," Dr. Khurana told the Independent. He said that his assumption is based on the fact that there are three billion people who own a cell phone these days - a number that is three times that of smokers, five million of which die each year. Dr. Khurana added that his arguments regarding the actual dangers of cell phone use will be "definitely proven" within the next decade. "We are currently experiencing a reactively unchecked and dangerous situation," he said, as quoted by CNN. He also pointed out the dangers of the possible "life-ending diagnosis" of brain tumors that cell phone use may result to. Dr. Khurana is a renowned neurosurgeon who has received 14 awards in the past 16 years. What Dr. Khurana is saying is probably true, and no, I'm not saying that with any sarcasm. Those of you who aren't using a earpiece or headset are holding an electro-magnetic device next to your brain. It's your brain, people...your brain ! (Liberals excluded, we know your cranium is empty, thus you face no danger.../sarcasm). 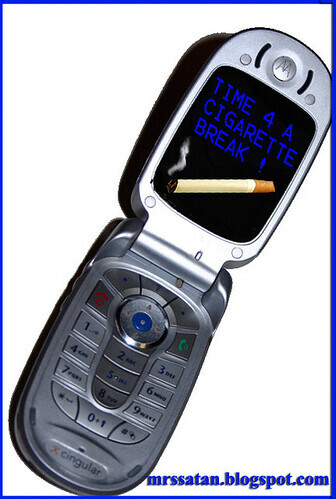 Text yourself a reminder to take a healthy cigarette smoking break during the day! That's when David Reynard, appearing on Larry King Live, declared he was suing NEC America Corp. because its cellular phone had given his wife a fatal brain tumor. One of these is that brain cancers, which in recent years have killed such notables as CIA director William Casey, Republican National Committee Chairman Lee Atwater and football star Lyle Alzado, are by no means unusual. Many Americans own cellular phones, and therefore a number of cellular phone users will get brain cancer just by chance. Studies show that brain cancers suspected to have come from radiation therapy took nine to 15 years to develop. Reynard, however, claimed he gave his wife her phone after she became pregnant and that she developed symptoms of her tumor during the same pregnancy. That gave her just a few months – not years – to develop the cancer. Of course cell phone manufacturers are going to say there is no link between their product and brain tumors. Does anyone remember tobacco companies denying a link between their product and cancer? Hello, people - - - is anyone out there listening? Maybe there is no link between holding a device next to your head that emits radiation and heat and their relation to brain tumors. Maybe it is only a coincidence. But while all this is being sorted out and research continues, use a headset or an earpiece and stop holding that damn phone next to your brain. Take up cigarette smoking instead. It's far less insidious. In breaking news, cell phones are no threat to libertards. For them, brain cancer is a not an issue. Kind of like testicular cancer for the poodle or the sissy. A non-event. Heh...really, the Pood and the Sissy never have to worry about testicular cancer, do they? Oh, damn, that's too funny!! !